An aerial mail and passenger service was instituted in the latter part of 1918 for the purpose of providing a rapid means of communication between London and Paris for the convenience of members of the Government and of the headquarters staff of the Air Ministry. This service was carried out by two squadrons, one stationed at Hendon, afterwards moved to Kenley, and one at Buc near Paris. In all 934 passengers, excluding crew, and 1020 mail bags or despatches have been carried in 744 trips over this route since the commencement of the service up to August 1919. Over 90% of these flights were between London and Paris with the rest to various towns in France and Belgium. The principle types of aircraft used were Handley Page 0/400 fitted with 2 Rolls Royce engines and DH4 or DH4A aircraft also fitted with Rolls Royce engines. Flights of these types amounted to 96% of the total flights made. The following table shows the percentage of trips completed by the various types of aircraft. All trips on which the destination was reached the same day have been counted as completed trips, even though forced landings had been made on route for weather or other reasons. As you can see the DH4 and DH4A were the real workhorses of the squadrons. 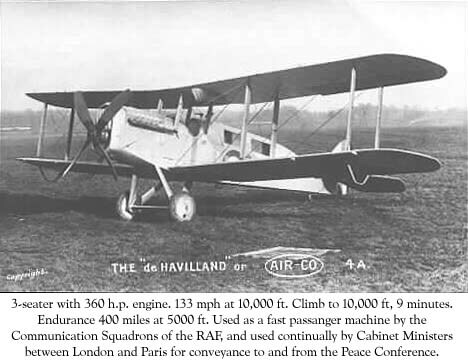 DH4 aircraft made 10 or more flights with one flight on average 6 days. In the case of the Handley Page 0/400 one in 7 days. In all 73 pilots made flights, this large number being due to demobilisation and constant state of flux of the personnel. As regards pilots who made 10 or more flights the frequency was one in 6 days for the DH4 pilots and one in 6 days for the Handley page pilots. Two pilots were carried on most occasions in Handley Page aircraft and two or sometimes three mechanics. It will be seen that the personnel and aircraft were not working to their maximum capacity. This accounted for to a great extent by the fact that the King’s Messenger leaves London very early and unless the weather conditions are then good the mails are carried by rail and steamers. On many occasions although not fit for flying when the King’s Messenger left, the weather had much improved within a couple of hours and the mail could then have gone by air. A kite balloon section was attached to the Wing, however it was very seldom in use. The total number of passengers (excluding crew) carried in May 1919 was 176, and the total number of mail bags or despatches carried was 225. Taking the average weight of a mail bag or despatch as 25lbs, and assuming the weight of a passenger to be 180lbs, including personnel luggage which has been carried, the total weight carried is 36,900lbs. It nay be noted that the average weight carried per month during the four months, May-August 1919 was 35,300lbs. As the routes over which the cargos were carried varied very slightly from month to month, the work done in May is a fair representative amount, differing as it does by only 4% from the monthly average. All this cost 30,585 pounds with the resulting cost per ounce was one shilling and a halfpenny over an average distance of 205 miles. The record of the London to Paris service from the point of view of accidents to personnel is not nearly so good as the record of the Folkestone to Cologne service. In the latter case it will be remembered that the casualties were one pilot and one passenger injured in 1842 flights. On the London to Paris route three pilots (including Captain Jefferson) and one passenger have been killed and two pilots and two passengers injured in a total of 744 flights. It must be remembered however that the date in respect of the Kenley to Paris route covers the period from November 1918 to August 1919, thus including all the winter months, whereas in the Folkestone to Cologne service, the return covers the period from March to August 1919. The casualties occurred in five accidents. 1. One pilot was killed and a passenger injured when a machine was caught in a sudden squall of hail and wind and crashed on the roof of a building. 2. One pilot (Captain Jefferson) and one passenger were killed when a machine came down in the Channel owing to bad weather. The report of the crash incident in The Times of the following day. His passenger was a Jewish gentleman who Jefferson was ferrying to Palestine, I believe. Reading it, I had the distinct impression that it was all rather hush-hush stuff and that it had only come to light because of the unfortunate crash! Perhaps the ‘Communications Sqd’ dealt in that kind of clandestine work. 3. One pilot was killed owing to complete engine failure immediately after taking off. The passenger in this instance escaped uninjured. 4. One pilot and a passenger were injured in a forced landing owing to weather. 5. One pilot was slightly injured in a forced landing owing to engine trouble. All the accidents due to weather conditions occurred before the end of May 1919. The two pilots who were reported as injured have since resumed flying duty.